Located in a Victorian Brownstone, this romantic floor thru garden level apartment is completely furnished, with a full kitchen, completely outfitted with all cooking and dining equipment, a large bath (extra long bathtub with claw legs and French style faucet), a queen sized bed in bedroom and large sofa/Queen pull out, and flat screen TV in Living room. Nicely decorated with wallpapers and original oil paintings and artwork. Private entrance with generous hall way included. Very conveniently located just 1 1/2 blocks from the subway, and walking distance from world class tourist attractions including: The Brooklyn Bridge, The Brooklyn Heights Promenade, Prospect Park, and New York Harbor and the berth of the QE2 . For those traveling for business, a nice walk to The Brooklyn City Hall and the many Court House Buildings (and Brooklyn Law School), and Wall Street and the NYC Financial District. Walk to the corner and find fabulous dining and food shops along Smith St.
A native New Yorker, with a background in the arts, Johanna Spoerri managed a family owned B&B for 10 years in Brooklyn. 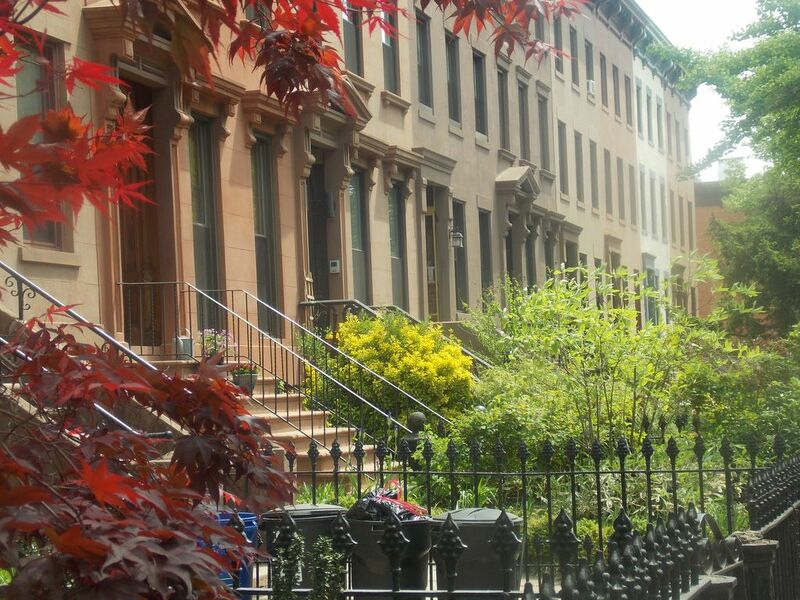 Now living in upstate New York with her husband Robert and son Mark, she is pleased to continue offering hospitality to visitors of New York City with the Lovely and Convenient Garden Apartment in Carroll Gardens. Our family has owned this property for over 40 years. We know the needs of our different types of clients; guests traveling to visit gamily members, tourists, business travelers, and Brooklyn residents looking for a place during renovations or waiting for a closing. Location, Location Location! One of the most accessible apartments to both Brooklyn and Manhattan locations and the countless charms of Carroll Gardens and Cobble Hill. Walking distance from NY Harbor. See the Statue of Liberty and the Brooklyn Bridge. Walk 1and 1/2 miles to pick up the ferry into Manhattan. Loved the location which made it easy to get around - a couple of minutes walk to the subway and easy walking distance to Smith and Court Street restaurants and to Whole Foods. Johanna was very accomodating with us leaving our bags there in the morning we were checking in and then again on the day we left. I loved the shower - yes it’s a bit hard to get in and out of and the curtain can hug you a bit but the shower pressure is great! 1. It’s very dark in the kitchen which can make it hard to cook or prepare food. There is no overhead light so you rely on the light from the microwave and a small lamp. Overall we had a great stay and enjoyed catching up with old friends in the neighbourhood. Our entire experience from arrival through departure was excellent. I whole-heartedly recommend this place for people that are looking for a great escape to Brooklyn and Manhattan. The F/G trains are 5 minutes away that get you into the City in no time. Your can spend hours on Smith and Court St. shopping, eating, and drinking coffee. And Park Slope / Prospect park is cheap cab ride away if want to check out that side of town. Brooklyn is made for walking, so bring comfortable shoes! You can walk the Brooklyn bridge / DUMBO via the Brooklyn Heights Promenade in 30 minutes ... do it..! Johanna is a great host and the place is set up with everything you need. Yes, it is true that you can hear the neighbor's children stomping about from the floor above - but honestly, this was quite minimal - and didn't visit to remain inside the apartment. We will be back for sure! Thanks Johanna...! This is a very cozy basement apartment in a leafy neighbourhood. The apartment has all you could need and is only a block from the nearest metro stop. The only thing preventing a 5 star review is the noisy neighbours upstairs (family with kids). The apartment is in a fabulously convenient location close to the subway and with a lovely outdoor area. It is very clean and the beds very comfortable with a well equipped full sized kitchen. Lots of great restaurants and bars close by. We found the shower tricky to use (although the bath tub beautiful to look at) but once we figured it out it was fine. Being the ground floor it’s inevitable that you’ll get some noise from above. Overall a great stay in a great place. I look forward to our return. The apartment was lovely. Well stocked with plenty of room for our things. Lovely bed and the location was great. My husband and I stayed here at the Carroll Garden Apartment for a week. It is a great place to stay and experience Brooklyn! There are stores, restaurants and historical sites all around and we had a great week! There was even a film shoot happening a block away - that was exciting! The parking is something to get used to for someone who has their own driveway at home, but we figured it out. The only issue we had was the internet. I am working on my advanced nursing degree online and it was difficult to complete some of my course work during our stay as the internet was in and out too frequently. Otherwise, we had a wonderful stay here and we are grateful to Johanna for her hospitality - we were lacking for nothing! Thank you, so much!! All Brooklyn Neighborhoods, Manhattan and all NYC attractions, MTA and Long Island Railroad, New York Harbor and QE2. Brooklyn Bridge, Fulton St Ferry, Statue of Liberty, Financial District of NYC including Wall St, Chinatown, Soho, Greenwich Village, Prospect Park and the Brooklyn Botanical Gardens, The Brooklyn Museum, The NY Aquarium at Coney Island, Brighton Beach, Brooklyn Navy Yard, Dumbo, Park Slope, Red Hook, Shopping at IKEA, Home Depot, Lowes, Fulton Mall, Macy's, antiques on Atlantic Avenue. Brooklyn City Hall, and Federal Court Houses. This apartment is designed for a maximum of 4 adults and one child under 3 years of age. Three adults and two children is okay, provided they are all family members.